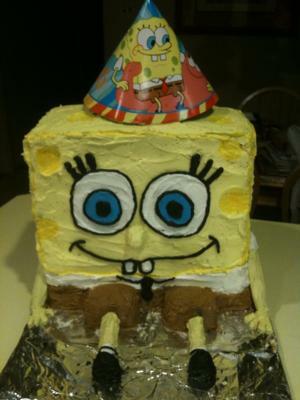 I found a picture of a 3D Sponge Bob sitting up and just had to do it! There were NO directions so I had to "figure it out" myself! I made a wooden base with wooden dowls to support the cake as I built it. I cut a sheet cake in 5" strips, placed a board cake between each layer until I had six levels. Then I pulled out the picture I had of Sponge Bob and started decorating. I used only butter cream icing. The arms and legs are pretzel rods covered in icing. The shoes are just blobs of black icing. My son's eyes almost POPPED out of his head! Wonderful!!!!! Excellent job!!!! I love it!!! !